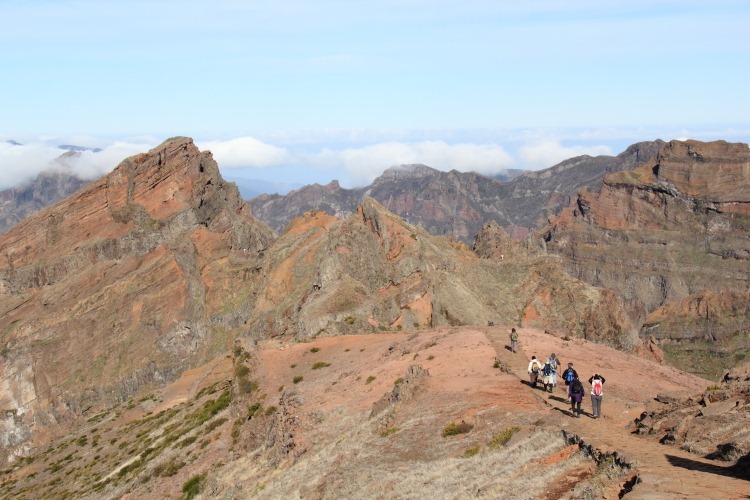 Our week seemed to have been leading up to today’s outing, the grand finale of the tour, the so-called balcony walk between Pico do Ariero, Madeira’s third highest peak at 1818 m/5965 ft, and Pico Ruivo, the highest point at 1862 m/6107 ft. 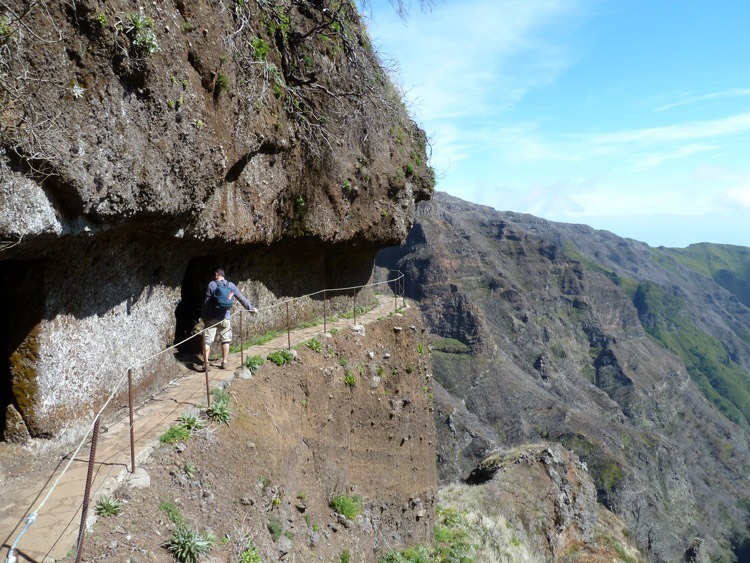 This has the reputation of being Madeira’s must-do walk. We couldn’t believe our luck; once again the morning dawned clear and bright – it looked as if we’d be in for a perfect day for mountain walking. Pico do Ariero may be Madeira’s third highest point but it is accessible by road and good ol’ Messrs Ford, Mercedes and Benz once again ferried us up to the start point. It may have been bright but at these altitudes the air is a bit cool so we were equipped with a few layers of clothing to make adjustments as necessary. After making last minute preparations and making the obligatory “ooh, ahh” noises at the scenery, we set off. Surprisingly, the walk began on what I can only describe as a paved footpath. I couldn’t believe the locals had put so much effort into their walking routes. It is a busy route so I suppose it helps with erosion control. As we progressed we came across areas that weren’t quite so groomed but, nonetheless, there was a lot of effort involved in maintaining the route, especially regarding handrails. 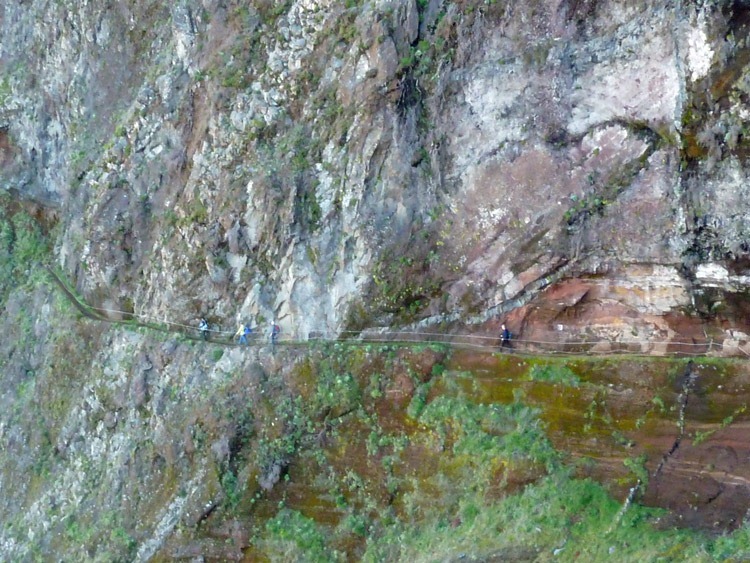 On some of the narrower sections, the handrails may not actually be used but I think one would feel decidedly more nervous were they not actually there. The term balcony walk perhaps seems a little odd so here’s a few shots that should go some way towards explaining the name. At 6.5 mls/10kms, this walk wasn’t particularly long but there was certainly more climbing. I guess you can’t get up to an island’s highest peak without putting in a little effort. 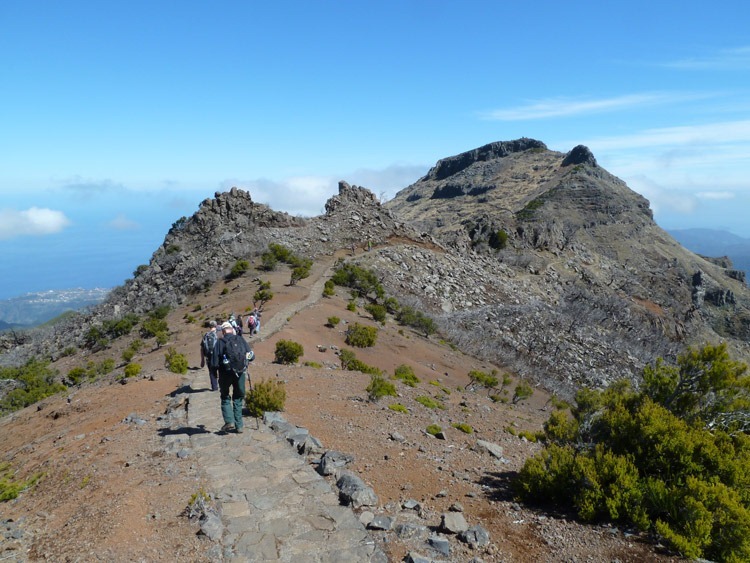 The final assault on the highest point, Pico Ruivo, certainly got the heart pumping but, with our gradual build-up to it throughout the week, it felt reasonably comfortable assisted by a pair of Leki walking poles. To avoid indigestion, we climbed first and ate second. The weather gods continued to smile on us and the sun shone right through our lunch at Pico Ruivo and on into our eventual short descent on yet another paved pedestrian highway to our faithful vans and drivers. This was a spectacular and very enjoyable walk. 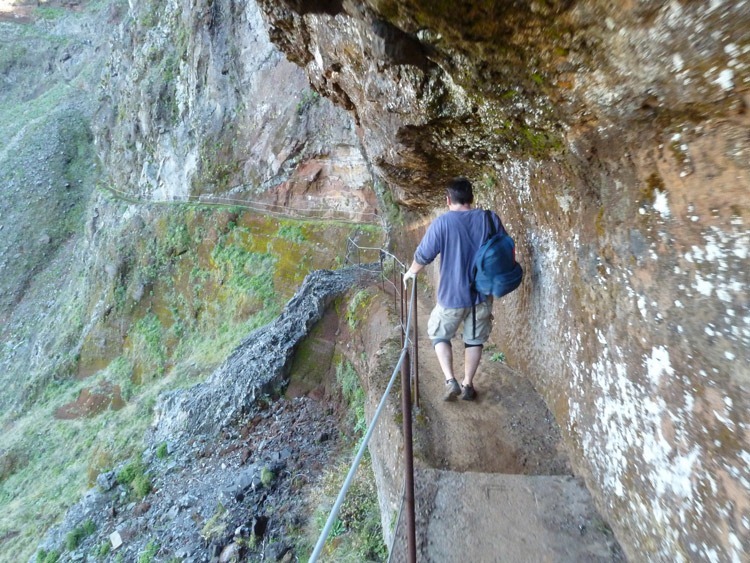 A delightful finish to our walking in Madeira, though we still had a free day in Funchal to look forward to. Feeling perhaps a little self satisfied at completing the walks and most certainly feeling very lucky that our time in the mountains had been blessed with such good weather, our last walking day finished with a return journey to Funchal where we were just in time to invade the Blandy’s Madeira lodge for a guided tour: interesting stuff and good value (€4.50) despite their free taster being very meagre. Well, it had to be done.